This project started, in a wholly different form, several years ago in response to two thoughts I had: "How can I make a long train without making excessively expensive?" and "I really want some modern rolling stock". Originally the obvious answer was articulated well cars. Well cars have very little structure to build, and Jacobs bogies mean relatively few wheels and even fewer couplers per unit length (compared to a train of the same length made up of "regular" 4-axle, 2-bogie rolling stock), both of which are particularly expensive parts. 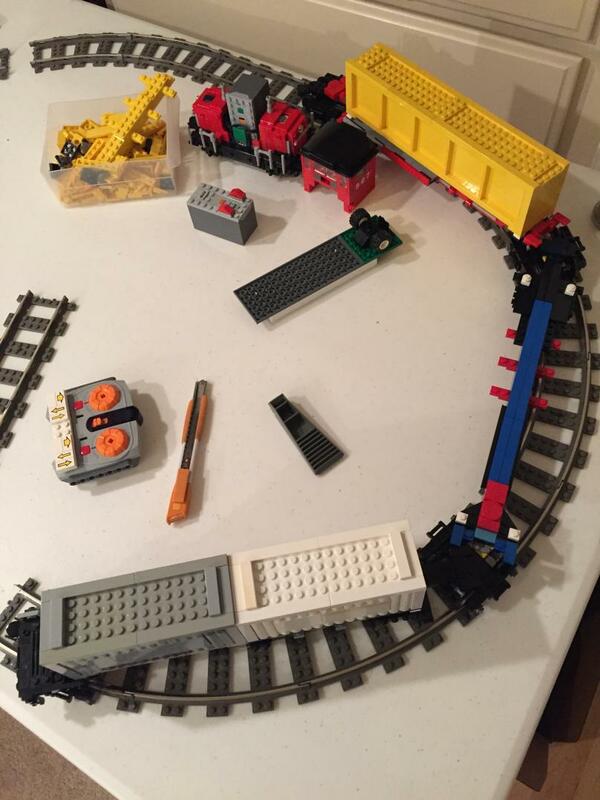 I would need to build containers to "fill out" the train, but that did not seem to be a big issue. Unfortunately the articulated well car project got to something like 95 to 99 percent completion when I pulled the plug. The car looked fine, that was never a problem, but they turned out to have more operational and structural issues than I had hoped: most poignantly they couldn't clear switch handles right after turns and the bottoms would fall out after extended running. Furthermore, to make the car look "filled" enough, I would need to build something like 15 to 20 TEU worth of containers, which increased part count and weight. Double-stacking containers also decreased stability and made the bottoms more likely to fall out. 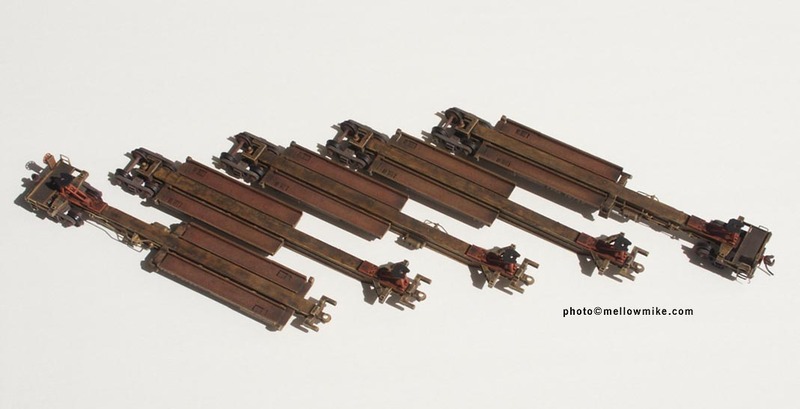 So the well cars ran empty at like one BayLTC show, and then they were shelved while I tried to think of solutions that I never found.Fast forward another year and I found out about articulated spine cars. 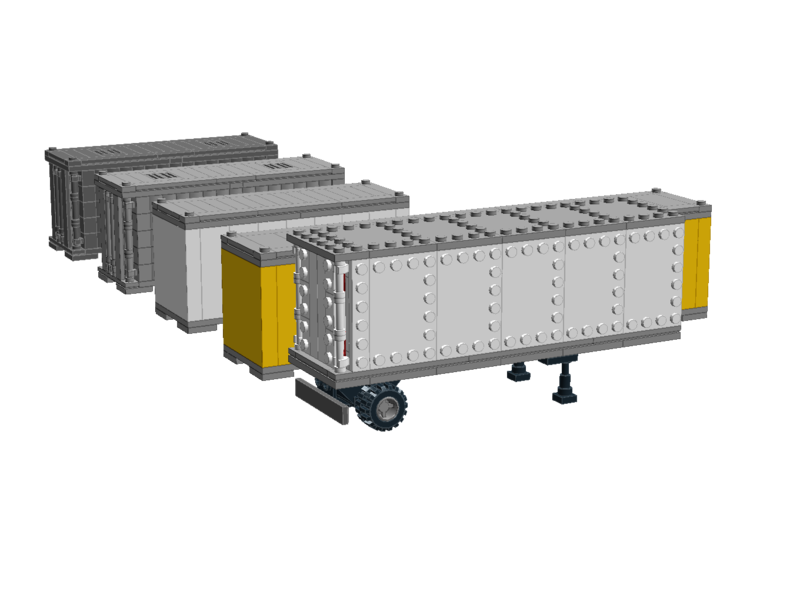 Spine cars are similar to well cars in that they are articulated and intermodal, but spine cars trade density for flexibility: they can't carry as many containers per unit length as well cars, but they can carry containers or trailers and can fit in a small loading gauge. 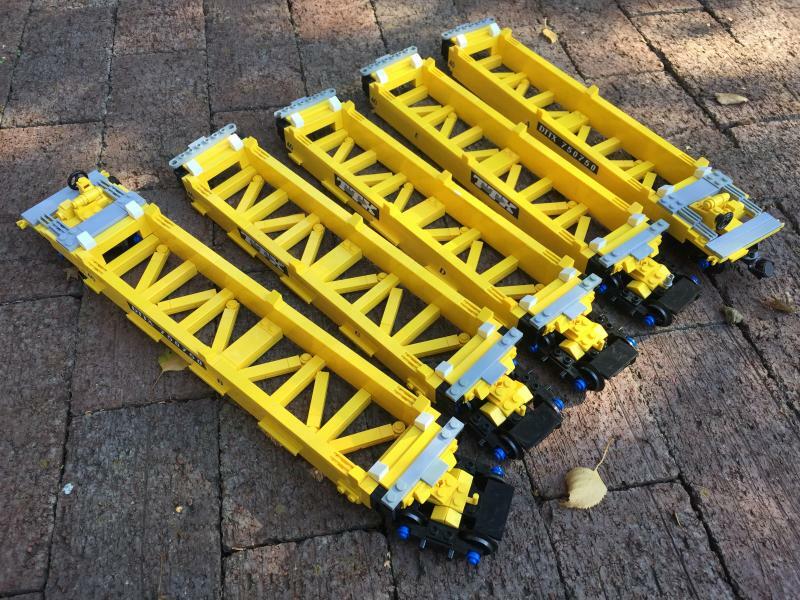 From a modeling perspective, spines have even less structure than wells, and more importantly can be filled with half of the 15 to 20 TEU worth of container, saving more weight and more parts. The car itself is 214 studs long and comprises just 1018 parts, giving a part per stud length of 4.76. 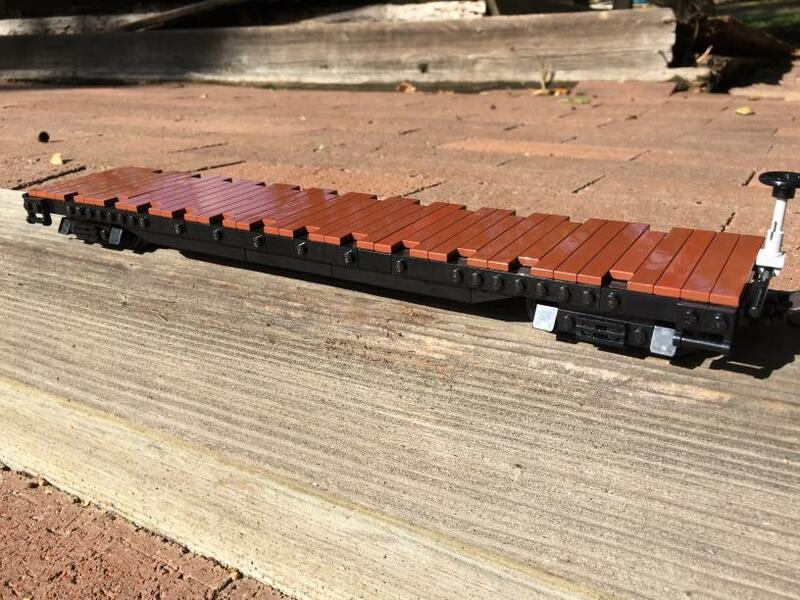 For comparison a relatively tame looking "regular" piece of rolling stock like my flat car is 33 studs long with 335 parts, giving a part per stud length of 9.85 - almost twice that of the spine car, so that gives an idea of how efficient the spine car actually is. And of course, the build would not be complete without containers. 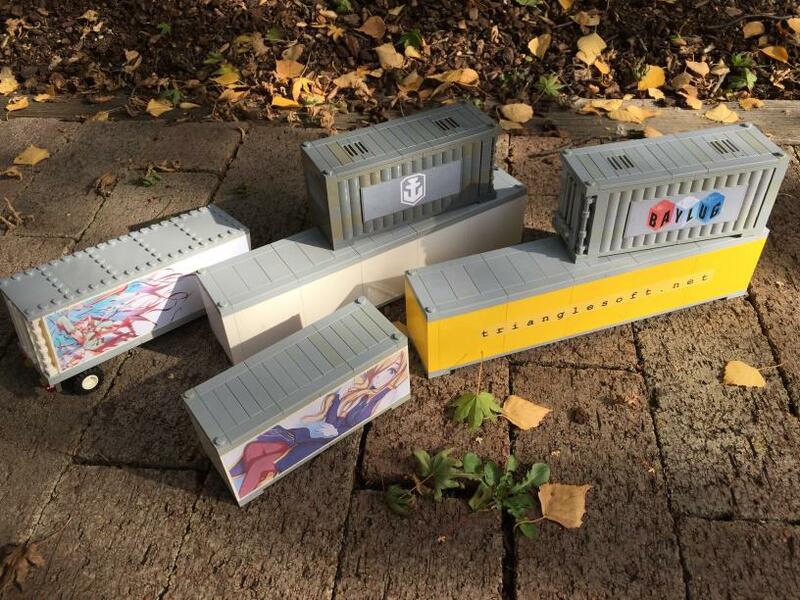 With the well cars, I built an ad-hoc collection of 20 and 40 foot containers, each with a slightly different design, partly because I didn't feel like it was the main part of the build, and partly because I needed so many. 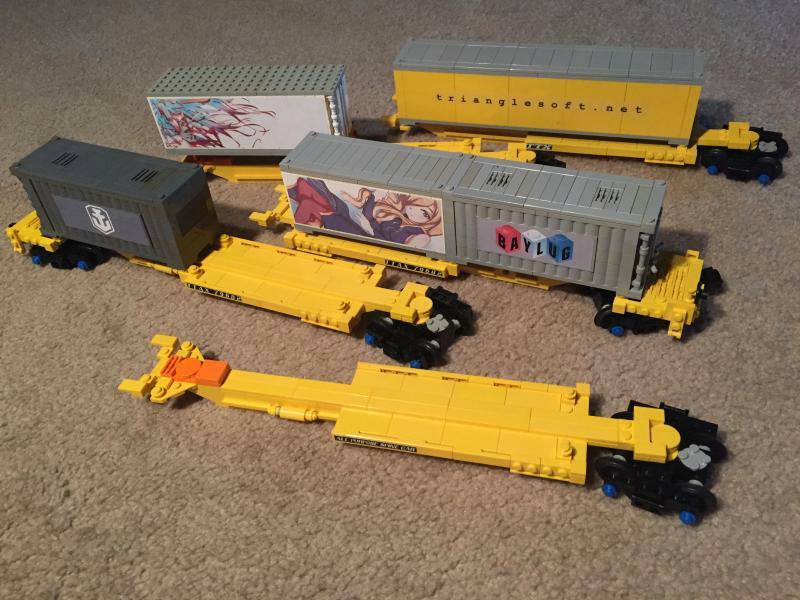 Since the spine cars would need much fewer containers to load up, I decided to make them good. Full gallery here, and have a nice day! Nicely done. 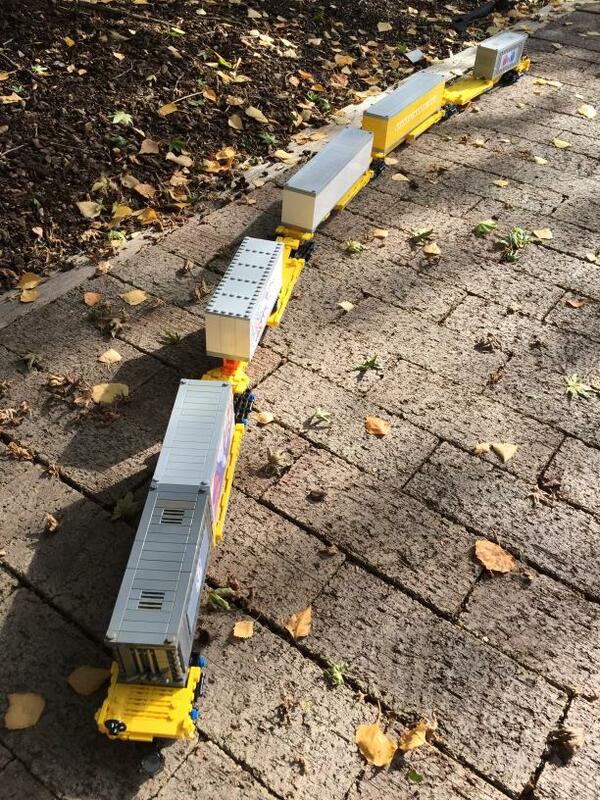 And more effective in getting a long train than those double stack cars. And to be honoust I like these better. I never understood those double stack cars anyway. I like this a lot - about how much would you say each unit of a full 'car' cost? Are all of the parts available for reasonable prices in large quantities? 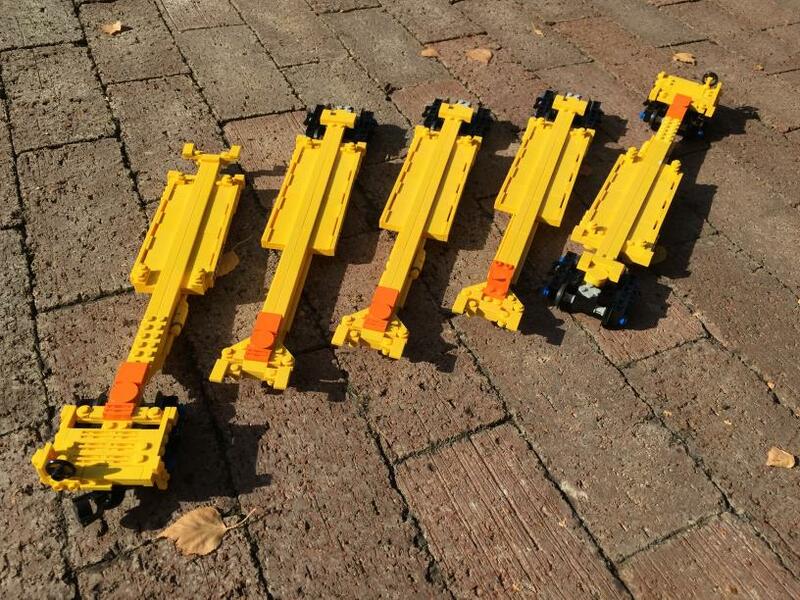 If you're building it entirely from scratch, my guess is maybe $20 to $25 from Bricklink for each of the five sections. Every 40-foot container's worth of container is probably another $10 to $15. There's definitely ways to do the containers cheaper though if you either reduce the detail or increase the weight. For example if you made the large containers from basic bricks and small plates, they'd cost next to nothing, but would probably weigh twice as much as the ones I've built from large panels and large plates. EDIT: I explicitly haven't used any super rare or super new parts though, so at the very least all of the parts should be very readily available. These look great! are your containers 6x32 and 6x16? 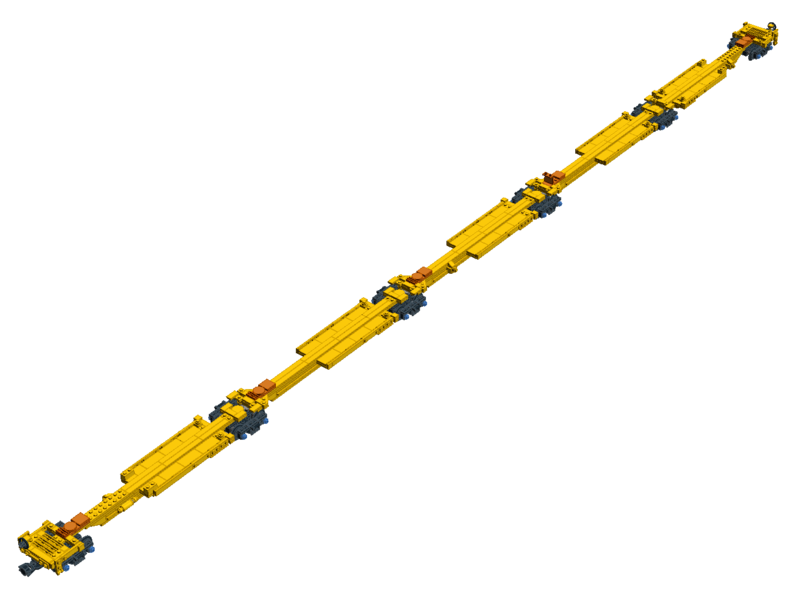 would you mind sharing the details of orange truck trailer attachement mechanism? The spine cars look fantastic (as do the well cars, even if they are mediocre running, they make a stunning static train) great work all around. This is a great looking model. I tried to do a few in brown but they keep falling apart. Perhaps I can reverse engineer and adapt these. 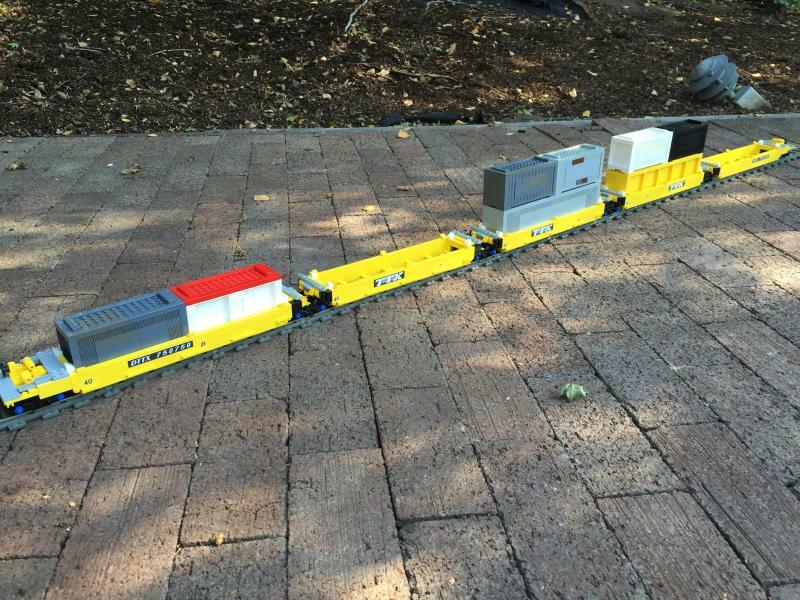 The twenty-foot containers are 6x16 (except for the RailBricks ones with the doors - those are nonstandard at 6x17) and the forty-foot containers are 6x32. The nice thing about 6x16/32 is that they will work with some official sets, ie the old Maersk train. 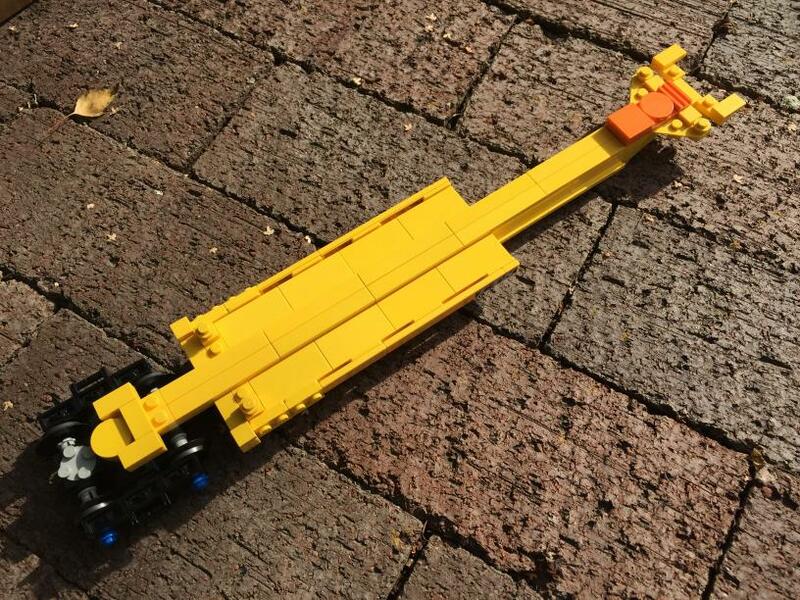 For the truck, there is nothing special: on the prototype those stands can fold up and collapse, but on the model, everything is static: The blue thing (which is a window on the actual model) connects to the trailer and gravity does everything else! I'll admit, these aren't the sturdiest things in the world, even though they're way better than my first attempt with the well cars. As far as I can tell, the trick is just to use as long of plates as possible! 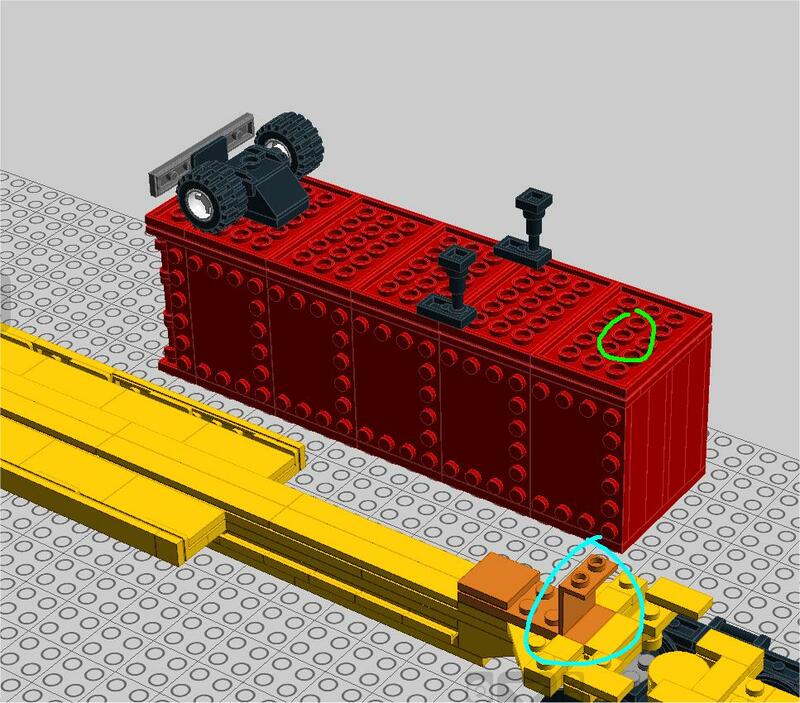 Even though that makes the cars sturdy enough to not fall apart while running, if you press down hard enough (ie even trying to attach the containers), the connections holding the lower parts of the spine will separate from the top parts. The best thing to do is put the containers on the cars first and then put them on the track. 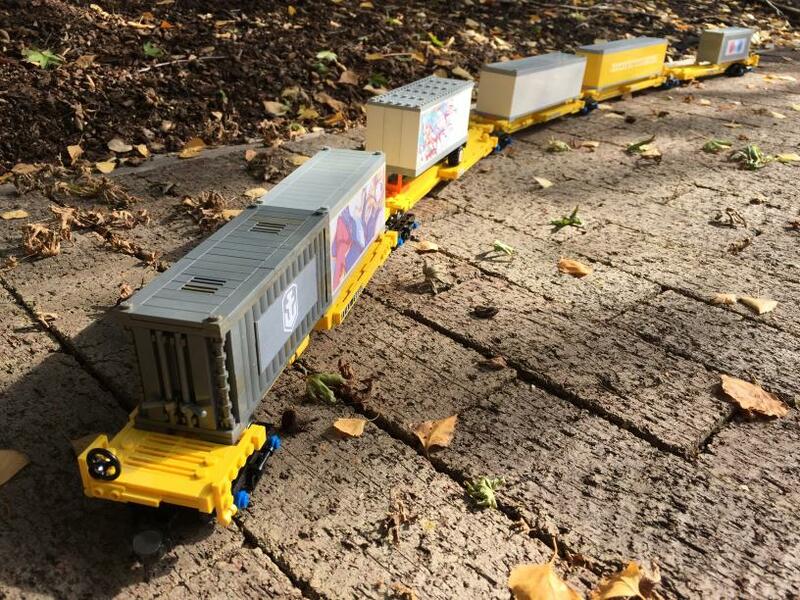 WOW ...this long wagon with shared bogies looks totally cool! Nicely done rake of spine cars. You have a good mix of detail and I understand the limitations based on my own well cars. Keep it up.